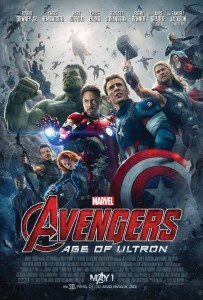 Avengers: Age of Ultron (2015): Written and directed by Joss Whedon. Based upon the comic series The Avengers created by Stan Lee and Jack Kirby. Starring: Robert Downey Jr., Chris Hemsworth, Scarlett Johansson, Chris Evans, Jeremy Renner, Mark Ruffalo, James Spader, Elizabeth Olsen, and Aaron Taylor-Johnson. Rated PG-13 for intense sequences of sci-fi action, violence and destruction, and for some suggestive comments. Running time: 141 minutes. Earth’s quippiest heroes return! I had mixed feelings about this latest installment, considering I wrote a largely ambivalent review of the original Avengers flick. I had expected a lot considering it was helmed by Joss Whedon, that darling of morally murky genre fare. As love showered down from the heavens upon what Whedon and Marvel had accomplished, I could’t help but feel that the whole thing was so…standard. A word I hadn’t necessarily associated with Whedon (especially considering The Cabin in the Woods came out the same year, a film he co-wrote and produced). While we saw glimpses of Whedon’s sensibility in 2012, it was drowned out by complicated S.H.I.E.L.D. bureaucracy and unending destructive tendencies. Luckily, Age of Ultron is infinitely more Whedon-y. Meta-jokes? Check. Prattling, philosophical villains? Check. Serious scenes ended by punch lines? Ohhh yeah. Whedon has a knack for balancing group dynamics, and he can generate sympathy for even the most minor of characters. Here the exposition has been scaled back (though there is something about cosmic stones; I tuned most of that out). Sure, we begin with an over-the-top action sequence, as is required. But it’s not long before a new character (Scarlet Witch, played by a fiendishly fun Elizabeth Olsen) has tapped into each of our heroes’ minds, exploring their deepest psychological nettles. Soon you realize that Whedon is genuinely interested in exploring characters in the context of a Hollywood blockbuster, and that really becomes the film’s saving grace. This film has real human interest. I admire how Whedon attempts to give each character a unique conflict to struggle with, conflicts that connect the major motives of the movie. Even Hawkeye, a bow and arrow man, has to struggle with his own relevancy amongst super soldiers, gods, and Hulks, and he gets some of the best jokes. Whedon may overstep his bounds in trying to make a love story between Black Widow and Hulk work, but at least he lets it play out as a symptom of the struggles of each of these characters. Of course, with so many characters to include, it’s inevitable that we don’t get the depth we might require. But there’s enough to make you care about them. We even have an interesting villain this time! Ultron is easily the most diabolical (and loquacious, thanks to Mr. Whedon) adversary yet. Rather than another external entity known only to fans well-versed in Marvel lore, we have an antagonist who’s been created by a protagonist we know very well. James Spader plays the role in motion capture, full of ego, bravado, and playful menace. Ultron speaks like an ambitious college student who took a Philosophy 101 class and now believes he has all the tools to fix the world. Its logic is that true change comes from the destruction of the human race, tearing down the old and in with the new. It’s how Ultron plans to accomplish this that I find extremely fascinating (which I won’t spoil, but let’s just say it’s both beautifully natural and artificial). Of course, to do this he’ll need to tear the Avengers apart. This gets hairier than the first Avengers flick, where egos and selfish routines ruled the day. This time it’s a conflict of strategies, firmly divided between Stark and Captain America. Of course both parties want to do the “right thing,” but what path do they take to get there? Stark is so paranoid about the safety of his friends that he feels the need to pre-empt any potential threats (hence why he creates Ultron in the first place). Of course, as we learned in Winter Soldier, Cap stands firmly against preemptive attacks. This level of moral ambiguity is much welcome to a franchise that has been mired in standard villain/hero binaries for so long. It’s a shame then, that Marvel has taken a step backward with CGI-heavy battle sequences. It’s especially disappointing when you consider last year’s Captain America: The Winter Soldier emphasized practical fight sequences, where each punch and kick had heft to it. You get the sense that the fights are a matter of course, items to check off the list of big superhero blockbuster. Admittedly there’s some clever staging (as when Thor proceeds to use Cap’s shield as a pinball, with baddies as bumpers), but it’s edited in a messy way that avoids the immediacy we want to feel in the thick of battle. More entertaining than those fight sequences are the actors who fill roles beyond the main cast. Linda Cardellini pops up as Hawkeye’s wife, lending a great show of support and wisdom. There’s Julie Delpy in a blink-or-you’ll-miss-it cameo, suitably creepy in one of the more effective scenes as we delve into Black Widow’s past. So compelling and chilling is this sequence that it makes you want to watch a movie just about Widow (seriously…why don’t we have a Black Widow movie yet?). And Paul Bettany turns up in a crucial role later on, providing a nice counterpoint to Ultron’s grandstanding. Thanks to this film and Captain America: The Winter Soldier, I find myself much more interested in the next round of films to come from Marvel Studios. I prefer Soldier’s paranoiac conspiracy and human intimacy to the bombast on display here, but Ultron is fun and thought-provoking in a way that promises Marvel may continue to explore some real human drama. It’s a good look for them.